Defense officials said the U.S. Navy is considering a plan to cancel the proposed service-life extensions for its oldest cruisers, the largest combatants in its naval fleet, Defense News reported Monday. The service wants to save money to procure more missiles and address the growing threats from Chinese and Russian anti-ship missiles. 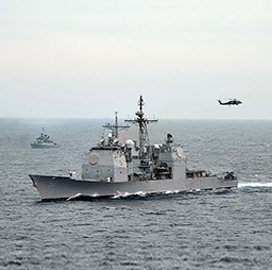 The Navy eyes decommissioning the cruisers Bunker Hill, Mobile Bay, Antietam, Leyte Gulf, San Jacinto and Lake Champlain in 2021 and 2022, which officials said are difficult to maintain due to aging components. All the six ships will reach or be near the end of their 35-year service lives over the next three years. However, the Navy would lack six ships to support its fleet of largest surface combatants if its ends the services of those cruisers by 2022. The Navy planned to buy a replacement large surface combatant first before retiring some of its aging cruisers, but the service branch previously decided to delay the acquisition until 2025. “We’re early in the discussion of requirements on the large surface combatant. I’ve got to tell you, given kind of the discussion that’s happened already, the first question that we have to do is prove to ourselves that we need a large surface combatant,” said Chief of Naval Operations Adm. John Richardson. The Navy intends to issue its updated 30-year shipbuilding plan in the coming days, which will include details on the future of the cruisers.